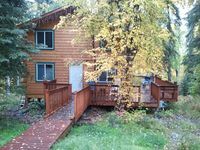 Property 5: Cozy two bedroom log cabin on the Chena River near town. Property 7: Arctic Dream - Spectacular view of the city and the aurora! Property 9: Spacious yet Cozy Home conveniently located in Fairbanks w/ Ample Amenities! Property 10: Comfortable House With Kitchen On The Chena River. Family Friendly. Property 12: Serene Fairbanks Cottage w/Garden on Chena River! Property 14: North Pole Apt w/Porch - Near Santa Claus House! Property 16: Hike, Kayak, Bike and Ski near the Chena River PERFECT for long-term guests! Property 17: Cozy Log / pond cabin ,Oppurtunity for dog sled rides . Property 29: Executive Suite 3 Bedroom, 2500 Sq Ft.
Property 31: New Listing! Heartland Ranch Studio on 38 acres! Cozy Fireplace! Walk to River! Property 33: We love Fairbanks, Alaska and want to help make your adventure here amazing! 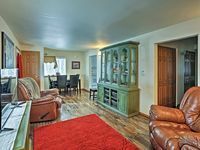 Property 46: New-Heartland Ranch on 38 acres-Walk to River-Cozy Fireplace!